Sr. Mary De Bacco, MPF, 86, died Thursday, February 7, 2019, at St. Joseph Hall, Home Healthcare Center for the Filippini Sisters, Villa Walsh Motherhouse, Morristown, N.J. The viewing will be held on Monday, February 11, from 2:00 p.m. to 4:00 p.m. in the St. Lucy Chapel at Villa Walsh, Morristown, NJ, followed by a Mass of Christian Burial at 4:00 p.m. Interment will be held privately in the Ave Maria Cemetery, February 12, at Villa Walsh. Arrangements are by the Doyle Funeral Home, Morristown, N.J.
Sr. Mary was awarded a BS degree in History and Italian, MS in Business Education from Marywood University, Scranton, P.A. ; Certification in Pastoral Counseling, Seton Hall University; MS from Fordham University Franciscan Spirituality. Sr. Mary taught in the middle school in the Archdioceses of Newark, N.J. and Trenton, N.J. She taught History, Italian and English at Villa Victoria and Villa Wash Academy, and was a pastoral minister at the Morris County Correctional Facility. Sister Mary held many administrative roles in the Province of St. Lucy. She served as local superior, Formator, Provincial Secretary, Provincial Councilor, Provincial Superior. Assignments in Rome included General Councilor for six years and General Superior of the Institute for twelve years. Her accomplishments were many, not only in the United States, but globally. She reached out and helped improve the lives of women and children in the countries of Albania, Ethiopia, Eritrea, India and Brazil where the Filippini Sisters serve. Sister Mary returned to the United States in 2007 accepting the roles as Archivist and Mission Director for the Province of Saint Lucy. She also volunteered at the Morristown Correctional Facility in pastoral care. In 2014 after a fall, Sister Mary became a resident at St. Joseph Hall and remained there until her passing. Sister Mary was a committed woman esteemed and loved by all who knew her. Although soft spoken and gentle, the strength of her convictions were clear and steadfast. These are the qualities that exemplified her as a credible and well respected leader and religious woman. Sr. Mary was predeceased by her parents Angelo and Teresa (Bovo) De Bacco and her brother Paul De Bacco and brother-in-law Sal Lamastra. She is survived by her sisters Elsa Lamastra and Angela (Frank) Valgenti and sister-in-law Marilyn De Bacco and many devoted, loving nieces and nephews. 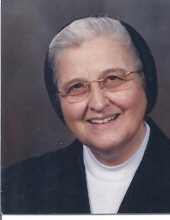 In lieu of flowers, donations in memory of Sr. Mary may be sent to St. Joseph Hall, c/o Sr. Ascenza Tizzano, MPF, Provincial Superior, Villa Walsh, 455 Western Avenue, Morristown, NJ 07960. To send flowers or a remembrance gift to the family of Sr. Mary De Bacco, please visit our Tribute Store. "Email Address" would like to share the life celebration of Sr. Mary De Bacco. Click on the "link" to go to share a favorite memory or leave a condolence message for the family.